This heat-pump clothes dryer from Whirlpool uses substantially less electricity than a conventional dryer, matching performance that has been available in Europe for some time. Image Credit: Whirlpool A totally different power curve: Power consumption for a conventional clothes dryer can spike five times as high as that in a heat pump clothes dryer. Total consumption also is much higher. Clothes dryers are the energy hogs of home appliances, accounting for 6 percent of total residential energy use and costing U.S. consumers $9 billion a year in power bills. Dryers use more electricity — an estimated 900 kilowatt hours a year — than either a refrigerator or a clothes washer. Homeowners in Europe have long had access to dryers that use heat-pump technology instead of electrical resistance elements or gas burners to dry clothes. 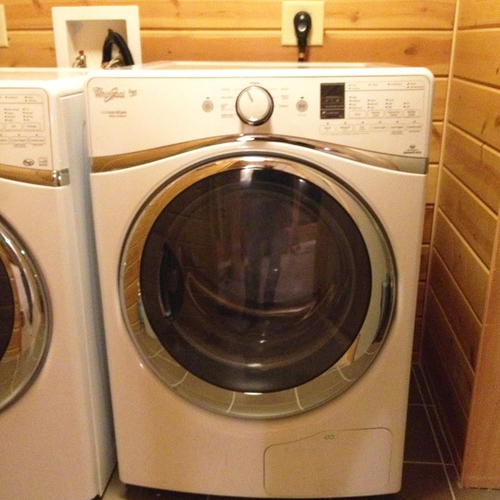 And now two manufacturers, Whirlpool and LG, are rolling out heat-pump clothes dryers for U.S. buyers. 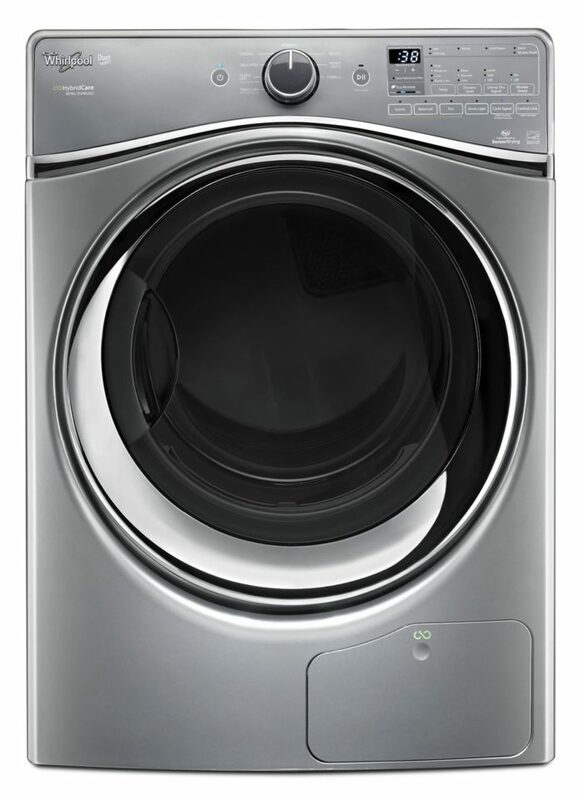 Whirlpool’s 7.3-cubic-foot HybridCare clothes dryer is similar in size to conventional dryers on the U.S. market (although larger than most European models). The HybridCare comes with a suggested retail price of $1,799 in white, more than four times the cost of a base model Whirlpool available at Lowe’s. LG Electronics says that its Eco Hybrid heat-pump dryer, also with a 7.3-cubic foot capacity, was the first dryer in the U.S. to combine conventional vented drying with heat pump technology and uses about 50 percent less electricity than a conventional electric dryer. It sells for about $1,700. Conventional dryers heat air inside a drum to drive moisture out of clothes. With most models, the moist, humid air is vented to the outside, which also takes some conditioned air from inside the house with it. So there’s a double energy penalty — high power consumption to run the dryer, and additional power to heat or cool inside air to replace what’s been lost. In Whirlpool’s heat pump clothes dryer, a refrigeration loop condenses the moisture picked up from the clothes and routes it to the same drain used by the clothes washer. Heat from the process is recirculated back to the drum. While the dryer has to be connected to a drain, it is not vented to the outside, so it can be installed in more places than a conventional dryer can. The design has won the EPA’s Emerging Technology Award, and earlier this month picked up an Innovation Award at the Consumer Electronics Show in Las Vegas. According to Whirlpool, the dryer uses up to 73% less energy in its “Eco” mode when compared to a pre-2004 conventional dryer. 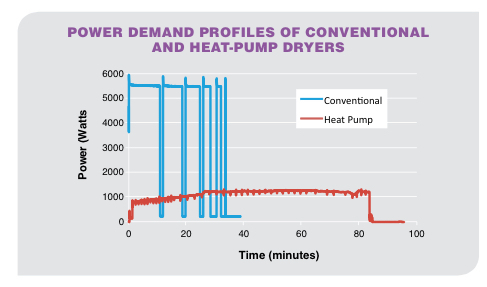 The Super Efficient Dryer Initiative estimates that heat-pump clothes dryers are 50 percent to 60 percent more efficient than conventional models. The HybridCare has three speed settings — Eco, Balanced and Speed — with average drying times of about 60 minutes, according to the company. A 1,300-watt heating element kicks in when the Speed cycle is selected. The company also says the dryer operates at lower temperatures than a conventional dryer, so it’s not as tough on delicate fabrics. It’s not clear whether the LG dryer is vented to the outside or taps into the washer drain like the Whirlpool model does. Those details aren’t posted at the company’s web site, and the company didn’t respond to queries. A few tinkerers have done as you propose -- adding an outside air duct to their laundry room. This doesn't really improve energy efficiency, however -- it just puts another hole in your thermal envelope, and introduces a new duct that will leak outdoor air when you don't want it to. Is the LG vented or not? It is surprisingly difficult to figure out whether the LG is vented or unvented and LG's web site is particularly unhelpful. 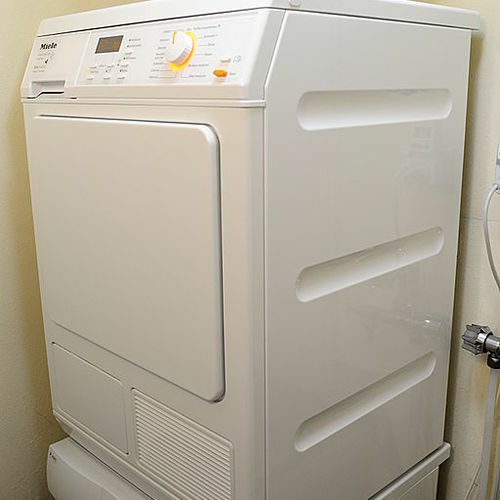 This review on laundry.reviewed.com (see link below) has a photo of the back of the dryer that shows a vent though. Whether this vent is used in all modes is unclear. Being able to skip the vent is appealing when you are trying to build a tight enclosure. 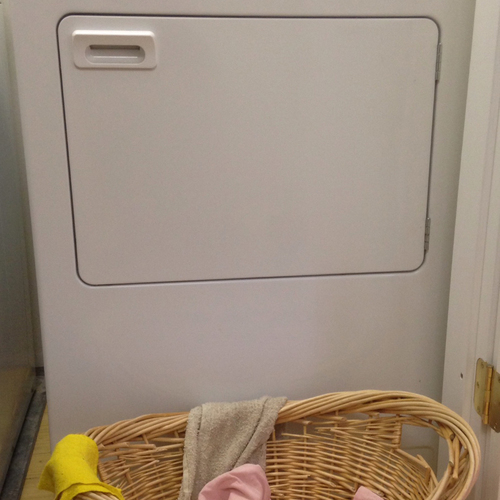 It also lets you put a dryer almost anywhere, so long as a drain is available. One of the last cases I worked on before I retired involved a brick warehouse condo project. The dryers were on the interiors and had long vents that were hard (or impossible) to clean. Where they punched through the old brick walls, they were hard to flash and leaked profusely. Heat pump dryers would have been a great solution and probably would be cheaper after considering installation (not to mention litigation) costs. A very tempting purchase, but I'll have to wait until they're more mainstream and cheaper. The payback currently just does not justify the upfront cost, so they're really a "green luxury" product at this point. One fewer hole vs. one new source of indoor air pollution? In planning our new home, I had been searching for a way to vent a dryer indoors for all the reasons described here - it seams like such a waste of energy to vent the hot air outside. But air-tight houses also have to think about controlling sources of indoor air pollution - what happens when (potentially) plastic based, flame retardant soaked, stain-guarded, wrinkle-free treated, anti-static cling coated clothing is heated to a high temperature in a humid environment? Seams very likely that the clothes would off-gas a cocktail of chemicals ... the last thing I want to put in my nice, air-tight living environment. A trade off - I personally plan to use an outdoor clothes line / indoor drying rack but we are also going to put in a regular, vented dryer in case we ever want to sell our new home. I'd be more worried about wearing those chemically treated fabrics than laundering them. The heat pump dryers use a lower temperature, although I wouldn't assume that off-gassing is necessarily temperature dependent. We have a clothesline also. Right now, if we could reach it through the snow (on snowshoes), anything longer than a hand towel would be in the snow. More snow on the way tomorrow. Finally, an interesting option to save energy on clothes drying. In this case, a heat pump. We don't have any heat pumps now but when we lived in the Southeast, we did. So, let's see. If I had $1700, would I spend it on a new dryer? (A Pareto analysis encourages acting on the most promising opportunities). Our clothes dryer uses natural gas. It works just fine. We have a tube-in-shell heat exchanger on the discharge to save energy during winter operation. We have the ability to recycle dryer exhaust into the living space when humidity is desired and fumes are not a concern. For summers and mild weather (about 7 months per year), we have a Mark #1 manual clothes line array outside. It cannot be easily seen by our suburban neighbors. It too works just fine. Very green. From past experience, I know of projects I've installed that have saved more energy for less $ than what a heat pump dryer would provide in our circumstances. Maybe it will prove interesting against future projects but for now it seems to fit in the "green luxury" category mentioned by Nick. However, I like that Scott presented the opportunity because it may be a good fit for others. Its coollll... I will get one today. I always wondered why conventional dryers can't be made with intakes for outside air as well as exhaust ducting? Update to Martin below: I was thinking more of a factory air intake that would allow a sealed dryer enclosure, similar to fireplace inserts that draw combustion air from the outside. Nevertheless, advanced heat pump dryers might have a chance once the price is driven down. Noise is always a concern, but unlike water heaters, the conventional dryer is already pretty noisy. does anybody know if this is available in Canada? Why not call up a local appliance store that sells Whirlpool appliances and ask? ...over Christmas, we bought one for my sister-in-law. The local big box store in France had only a couple vented models on the floor and they were almost as expensive as the condensing models. There were a half dozen condensing models, all with pretty much the same properties, looked like they might even come from the same factory with slightly different parts on the outside. Whirlpool was one of the brands. Price? 330 to 390 euros. My sister-in-law, who pays close attention to her clothes, is happy with the purchase. Try this (in French): http://www.darty.com/nav/achat/gros_electromenager/seche-linge/index.html . "Evacuation" means exhausting, "condensation" means water discharge. The low prices are interesting. "Séchage par sonde" means "drying time determined by a sensor." You might note that the retail price includes Value Added Tax of probably 20%. Here we go again! Does the same caculation that applied to hot water heaters apply to dryers? The heat pump dryer appears to cost about $1200 more than the conventional electric resistance dryer. That buys 350-400watts of Pv. with a yearly production of perhaps 700 kwh. Average yearly kwh for conventional dryer according to the article 900kwh. So 80% reduction vs. 50% for the heat pump dryer. Plus the Pv will last through 3 dryers lifetimes. Apparently, if you have the roof space there is no contest. PV wins hands down. One fly in the ointment: some U.S. states are undermining net-metering agreements, piling new fees on PV owners. Until batteries get a little cheaper, homeowners in these PV-hostile states are between a rock and a hard place. For more info, see Wisconsin Alters Net-Metering Rules. My two cents... 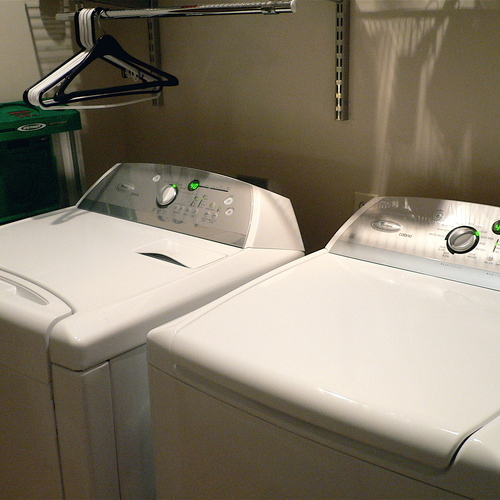 I have two condensing dryers (LG). They are great, but both have suffered pump failures after about 3 yrs. The pump is only $50 but it is a pain to install. I hope not to have to do this every 3 years, but time will tell!